Full details of the requirements for BER’S can be found in S.I. 666 of 2006 . 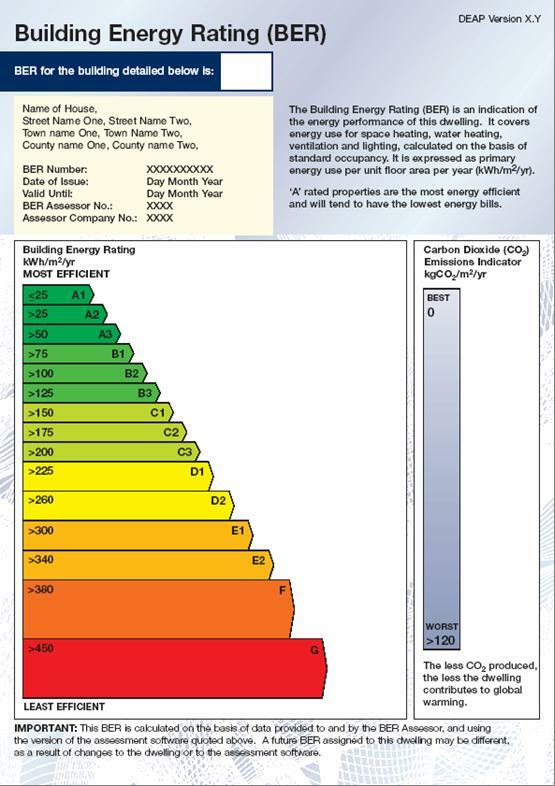 To see what a Building Energy Rating Certificate looks like please click here . To see an example of an advisory report, please click here . BER assessments are carried out by registered BER Assessors who have been trained under the National Framework of Qualifications and have registered with SEAI. A BER for a building will be valid for 10 years from the date of it being issued, unless there is a material change in the building which could affect its energy performance – for example an extension to the building, a significant change to the building fabric or a change in the heating system or fuel used. Therefore if a property which has received a BER is placed on the market within 10 years of that BER being issued, and the property has experienced no relevant alteration in the meantime, then that same BER may be used by the building owner for the purposes of meeting their obligations under the Regulations.